Our next Discovery Bike Ride will be on Saturday, Aug. 20, to the Greenest Household in Maple Ridge. This will be an 18 km ride, with some hills, but we'll take it easy. There is a short stretch of horse trail included in the route as well where we may have to walk, so don't put on your best shoes! 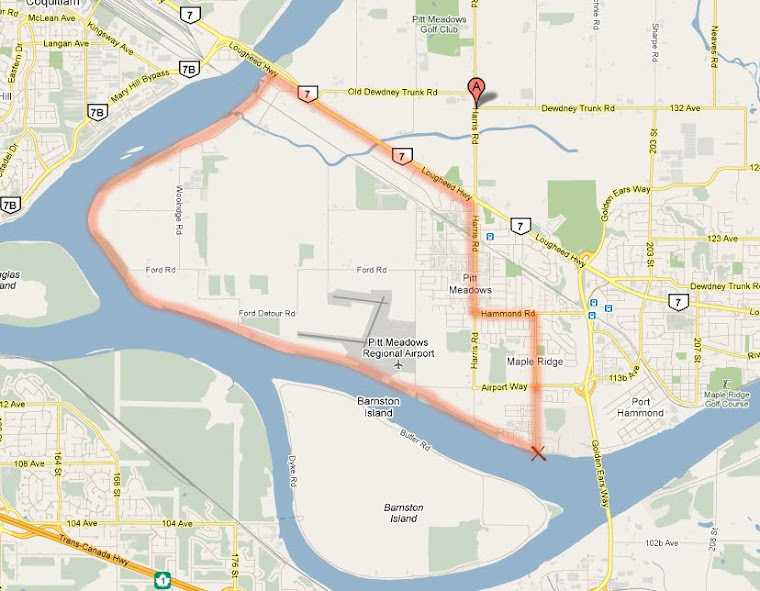 We'll start the ride at 11:00 am at Starbucks at 240th Street and Dewdney, which is right along the 123 Bike Route. Here's the suggested route, which we'll ride counter-clockwise. Our first stop will be at the Bell Irving Fish Hatchery (B) for a picnic, so bring your lunch! The second stop will be at Geoff and Liz Hancock's place on 244 Street (A). In August 2009 they won first prize in a "Greenest Household Contest" organized by the Metropolis at Metrotown Green Team, and were featured in an article in the Vancouver Sun. Let's go check it out and see for ourselves what we can learn from them. If you like to do this ride, please send an e-mail to Jackie at jchow23708@yahoo.ca. Please note that our rides are "unguided", and cyclists following the suggested route do so at their own risk.